This month I am focusing on 3 cups, keyword; abundance. This card is not traditionally associated with abundance in other decks, but usually with friendship and good feeling. However here we have the abundance keyword. If we look at the Kabbalistic position we have the threes in the position of Binah – this is the node of understanding, it is the third node of the tree of life from the top. 1 being the oneness of all creation, 2 the duality as this oneness splits to know itself, and three the result of the 1 and 2 coming together. it is like the observer, the understanding of the oneness and duality preceding it. It can also be likened to the mother and father creating the child – the third position is a new creation that encompasses the two sides of something. So in this way it is also linked with fertility. 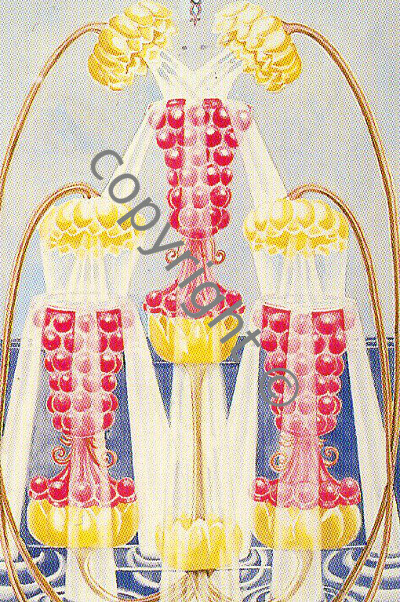 The three of cups is a cups card so in the realm of emotions and feeling based perception. When we have our feelings straight about who we are, when we feel connected to the whole, yet are also comfortable with our separateness and duality then we are in balance and life flows to us – creating abundance in our life so we have enough at all times comes more easily and this I feel relates to the keyword of abundance; the attraction of positive events and things to us as we allow both our connection and our duality equal place in our lives. Crowley’s comments on the card saying that it is representing love coming to fruition and is the spiritual basis of fertility. Often in practice this card comes up in readings when our life is feeling good and when we have connections and support around us through which abundance flows. Favours from friends and a general feeling of being able to be free of scarcity thinking is usually present in the querant’s situation. There is a sense of constant renewal and understanding we are fully free of material obsession when we trust in ourselves to be able to always create, manifest or bring to us that which we most need. It may not indicate huge wealth, but more a feeling of physical and of emotional security. From this perspective it often refers to a close friendship, or even two, around the querant, someone who the querant can rely on to help them feel secure in their own world. Often people intuitive feel this card is a ‘bit much’ and a bit sickly looking, this feeling also can be linked to Crowley’s warning about the card as he says “the good things in life though enjoyed, should be distrusted” So there is a sense of needing to stay aware and recognise ones own perceptions, and drives in life. In a concrete way we can see this as needing to make sure we both listen to, and enjoy, our friends’ advice, whilst also hold in our own self the separateness to consider whether we deep in ourself should follow any advice or perception or whether our truth differs from that of our friend in that situation. The enjoyment of life’s pleasures may not be in itself the solution to our problems, as the enjoyment of chocolate doesn’t give us full nutrition. If we revel in this abundance alone without looking to all areas of our lives then we are in danger of our shadows ruling us rather than us being in conscious acceptance and balance with our shadow nature.